When I look back on my writing career, I believe I will cite July 26, 2015, as the ultimate pinnacle. That was the day I got to drive an overpriced convertible SUV that looks like an angry clothing iron. 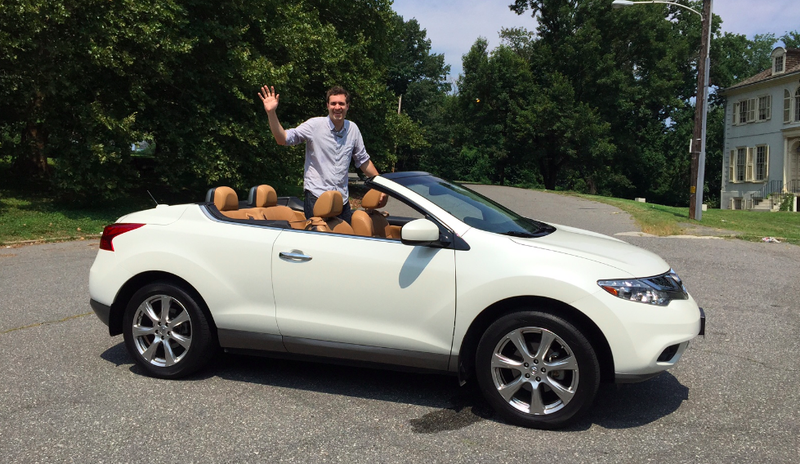 Yes, ladies and gentlemen, that’s right: I’ve driven the Nissan Murano CrossCabriolet. And I haven’t just driven it. I spent the day with it. Running errands. Cruising around town. Assuring my neighbors that it won’t be a permanent addition to our parking lot. It was a glorious day, and I invite you to experience it with me. You could start by following me on Twitter, where I posted a photo of myself with the Murano CrossCabriolet that drew many excited responses from readers. My readers love the Nissan Murano CrossCabriolet because of what it represents: one large, multi-national corporation’s struggle to lose money in a world filled with profit and opportunity. You could also watch my Nissan Murano CrossCabriolet video, in which I bring the Murano CrossCabriolet into your homes and offices – unless, of course, your current setting renders it impossible for you to view Internet videos, in which case I suggest you grab a mobile device and head for the toilet. But I’m getting ahead of myself here. Before I get into the ins and outs of the Murano Crosscabriolet, we should back up and discuss what the Murano CrossCabriolet is and what it isn’t. What it is is the world’s first SU-vertible, a part-SUV, part-convertible that’s supposed to be just as comfortable driving to the beach as it is tackling rough roads. What it isn’t is very good. I still remember when Nissan threatened to come out with the Murano CrossCabriolet, back in 2010. First, there was a concept car. They won’t build it, I thought. Then, a production model. They won’t build it. Then, some magazine reviews. They won’t build it. Then I saw one on the street. They built it. And it wasn’t just that they built it. It’s that they decided to charge nearly $48,000 for the privilege of owning one, which was deep into BMW 5 Series territory. To illustrate how ridiculous this is, I want you to imagine for a moment that you’re a car shopper with a budget of fifty grand. Do you buy a new BMW? An Audi? A Mercedes? Or a convertible Nissan that looks like a beached whale wearing a fedora? For more pricing excitement, here’s Murano CrossCabriolet fun fact: when it came out in 2011, it was Nissan’s second-most expensive car, after the GT-R. But even the pricing wouldn’t have been so bad if it weren’t for the fact that it was so obvious to everyone that it would be a failure, aside from the six guys at Nissan who designed the thing using RoseArt markets and a hot glue gun. The two-door SUV segment has always been a graveyard of bad ideas, like the Toyota RAV4, and the Kia Sportage, and the Ford Explorer Sport, and the Isuzu Amigo, and the Mazda Navajo, all of which failed so miserably that each of those automakers immediately abandoned two-door SUV production forever. And here was Nissan, thinking they had found some secret cache of two-door SUV fanatics, hiding out in the $50,000 price range. But was it at least an acceptable vehicle? Of course not! We’ll start with visibility. With the top raised, the Murano CrossCabriolet suffers from the same issue as nearly all convertibles: you can’t see anything smaller than a fire station. So what Nissan did was, they fitted not one but two rear windows, each roughly the size of a hand saw. Unfortunately, the steep rake of the convertible top ensures that these windows have no practical purpose, except for viewing a) the sky, and b) the trees. So these windows are not very good for visibility, though I admit they would be excellent for birdwatching in the rain. And it isn’t any better with the top down. The problem is this: between the typical tall SUV ride height and the typical high convertible rear deck, you can’t see anything when you’re backing up. It’s good that the CrossCabriolet I drove included a backup camera, because the rear end can hide a wide variety of objects, like shrubs, bushes, fire hydrants, baseball stadiums, inner-city neighborhoods, major American landmarks, etc. Then there’s the cowl shake. My God, the cowl shake. In many ways, the Murano CrossCabriolet was actually better than I was expecting, because I went into the experience thinking it would be a modern-day Yugo. But not the cowl shake. The cowl shake was much worse. It was so bad that I honestly thought the windshield might dislodge itself from the body on some bump and fall into my lap like an airplane tray table. I swear you’d have more structural rigidity from those military Jeeps whose windshields were actually designed to fold down with hinges. As you might imagine, the kind of convertible engineered with horrible cowl shake is also the kind of convertible that’s about as fun to drive as a shipping pallet with wheels. And indeed, the Murano CrossCabriolet has its on-road downsides. For example: despite a weight gain to more than 4,400 pounds, the Murano CrossCabriolet uses the same engine as the standard Murano – though I must report, in the interests of journalistic accuracy, that it adds an additional five horsepower. Unfortunately, those extra horses must be newborn foals, because the thing gets off the line with the same verve as a Winnebago. And then there’s the handling, which I call ponderous: essentially, you turn the wheel, and the Murano CrossCabriolet ponders where to go. And then there’s the practicality. Oh, the practicality. We’ve already established that this vehicle — designed to double as a “fun convertible” and a “practical SUV” — is certainly no fun convertible. So you think maybe it redeems itself by being a practical SUV. But that’s not true either: the trunk is only large enough for a stapler, or possibly a three-hole punch, while the rear seats were clearly designed to only carry children, or possibly those creepy plastic dolls that children sometimes carry around with them. There’s no trunk pass-through for larger items, and you can’t really take this thing very far off-road. In other words: in an attempt to combine “convertible” and “SUV,” Nissan failed at both. This would be like going out in search of a pillow that’s both fluffy and soft, and coming home with a toner cartridge. So are there benefits? Of course there are! For instance: the interior is a nice place to be, unless of course the top is down and people can see you. And prices are finally coming down to the point where they should’ve been originally: eleven grand and a partial trade for a riding mower. So what’s my verdict? Not surprisingly, I love this thing. Oh, sure, it’s unashamedly bad in every way: it’s ugly, it’s slow, it’s sloppy around corners and shaky over bumps; it’s expensive, it’s impractical, and it’s compromised. But by God, it’s unique. And in today’s world of Camrys and Accords, of Elantras and Malibus, we need more cars like the Murano CrossCabriolet. We will not buy them, of course. But it’s nice to know they’re there.